Toei Animation have announced a new movie based on the Ojamajo Doremi magical girl anime to commemorate the 20th anniversary of the series. 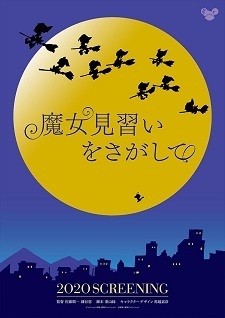 The film, titled Majo Minarai wo Sagashite, was announced to premiere in 2020 at an AnimeJapan 2019 stage event featuring original voice cast members from the 1999 debut work. When Ojamajo Doremi premiered in 1999, it was the first magical girl series produced by Toei since Mahou Shoujo Lalabel ended in 1981. It was also the first instance in which Toei Animation used the collective pseudonym Izumi Toudou as the work's original creator. That pseudonym would subsequently be used to credit the creation of the Precure franchise. As part of the 20th anniversary commemoration, Toei are also producing a 26-episode Flash-based web anime series titled Ojamajo Doremi: Owarai Gekijou. The first episode has been released on the studio's official YouTube channel, and additional episodes will be streamed every two weeks beginning April 14. A new light novel series, titled Ojamajo Doremi 20's and featuring the series characters in their 20s, will also be released this summer. Toei will also hold 20th anniversary events for the series in various cities throughout Japan. The first event, whose tickets can be reserved by lottery beginning April 1, will be held in Fukuoka on May 17. A second event will be held in Hokkaido in the summer. Wow, just look at that staff lineup! This is pretty much guaranteed to be good. Much props to Toei for keeping a lot of the original staff together for this. I haven’t finished the series yet, but I’m really enjoying it. It’s good to know I have more Doremi to look forward to. Ok, this is by far the most interesting/ best announcement yet of the day, I'm looking forward to it. Also, I'll take it as a sign to finally rewatch the series. "When Ojamajo Doremi premiered in 1999, it was the first magical girl series produced by Toei since Mahou Shoujo Lalabel ended in 1981"
That's an all-star staff team, especially Satou Junichi. Him being in charge pretty much cements the quality of this film. wow , i have watched a couple episodes on tv as a kid, still remember it , looking forward to the movie. Sailor Moon is often not strictly considered a "mahou shoujo" title in Japan. Yes, it certainly derives from those elements, but strictly "mahou shoujo" titles generally have characters that personify witches. Sailor Moon, on the other hand, personify warrior guardians more akin to the live-action Super Sentai series. More mahou shoujo is always welcome. And the SAME CAST AFTER 20 YEARS? Are they gods or something? That's awesome, count me in. Dude! This was one of the very first shows i've ever watched on tv when i was a kid! It's awesome to see a new announcement of it, because i know i'm gonna rewatch everything from this franchise for nostalgia's sake in the near future. There were Doremi light novels that continued after the series ended, when characters reached high school and ended in the 9th volume when characters graduated after 3 years and pursued their dreams. So the new LN will continue the story. I wonder from where the film wll start. Hopefully a new series will at least adapt one of the novels. Yeah! Ojamajo Doremi returns.. Let's see how the movie turns out. Huh, interesting. So Precure isn't a mahou shoujo either? Wow, Ojamajo Doremi has been here for twenty years? Congratulations to everyone who was and is involved with the series! Oh wow! I never thought i would see anything new with Doremi again, instant PTW, now, i really need to think about re-watching the first two seasons and/or completing the other seasons i haven't seen yet. Can't wait for the movie. The short that Toei posted on YouTube was super cute too! Would be cool if the movie was the adaption of the novel where they are teenagers. More Mahou Shoujo is always welcome. No, it just took inspiration. Ojamajo Doremi, Little Witch Academia, Sugar Sugar Rune, Majokko Megu-chan... are actual mahou shoujo series.